Maybe my confidence was shaken from my lego cake disaster. But, I refused to be beaten by a cake! 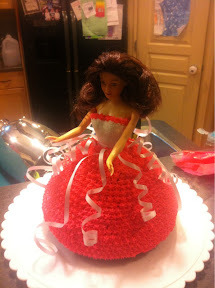 I had a few minor issues at first with this Classic Wonder Mold Doll Cake. Maybe I was expecting more but honestly I just don’t like the pan. Having a screw in the bottom of my pan made it sit funny in my oven and when you pull the pan out of the oven it tilts making it challenging to pour the cake batter into the pan in the first place. Umm, try an hour and no, I remembered the metal rod and yes, it was inserted into the middle of the cake for even baking. So, already we are looking at 2 hours for a cake that hasn’t been crumb coated or decorated. Cake removal was really quite easy but the cake either shrunk in the pan or didn’t rise as high as I would like. This cake by far was the easiest to decorate so I’m officially out of my funk plus I used the classic buttercream icing so my icing set properly and I didn’t wake up to a disaster. Hope the cake tastes as wonderful as it looks but we won’t find that out till later.